A week ago, Fashion Week was in full swing in Paris. Fashion Week, whether in Paris, Milan, London, or New York, has always been known for a display of cutting edge notions of what beauty can look like. 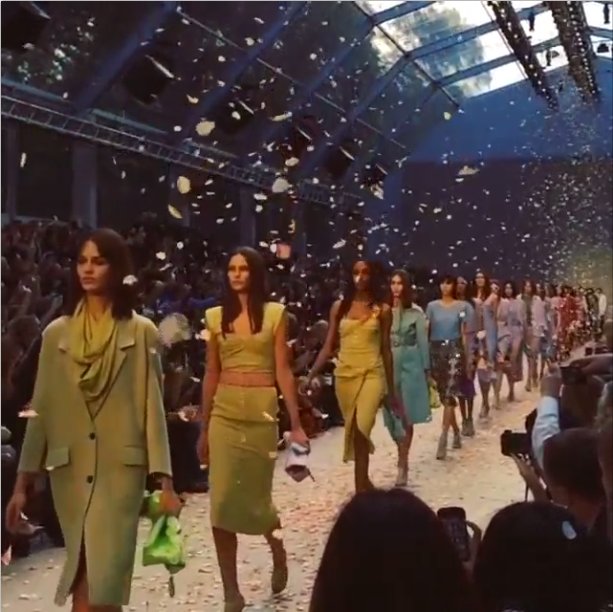 Those who follow both Fashion Week and Apple’s releases might remember last year’s London Fashion Week, where the iPhone 5S’s slow motion video capability was debuted with an Instagram video of a Burberry runway show (video here). Still from @burberry‘s iPhone 5S slow motion video of their Spring/Summer 2014 runway show at London Fashion Week. Apple has been working to be seen as “fashionable tech” arguably since the clamshell iBook from fifteen years ago, which featured bright colors and rounded corners — a significant departure from the existing design of laptops. As mobile phones became common place, so did phone cases and charms. A fashionable person’s cell phone was not complete without a shiny cover or sparkly charm. In the 90s, merely having a cell phone was a status symbol, but by the time Motorola introduced the RAZR, it was clear that the kind of cell phone you had was as important as simply owning one. And this trend has skyrocketed since the invention of the Smart Phone. As technology seeps deeper and deeper into our every day lives, it makes perfect sense that it becomes a part of our fashion aesthetic. We carry our Smart Phones with us everywhere, and for many of us, they are constantly in our hand. It functions in many ways like a clutch purse, but it is not limited to a feminine look and is far more likely to appear in a professional setting.